Just like the Nokia 3.1 plus that got the Pie update a couple of weeks ago, HMD has started rolling out the stable Android 9 update for the regular Nokia 3.1. "To celebrate @AndroidAuth recognizing us for the best pie delivery in the industry, it is our pleasure to cater you a very special serving ! Your premium companion, Nokia 3.1 now offers the sweetest experience with Android 9, Pie! Nokia smartphones get better with time!" The Nokia 3.1 was released in May of last year with Android 8.1 out of the box. The phone which sports a 5.2-inch display is powered by MediaTek MT6750 processor, coupled with up to 3GB RAM and 32GB storage. It also packs a 2,990 mAh battery. 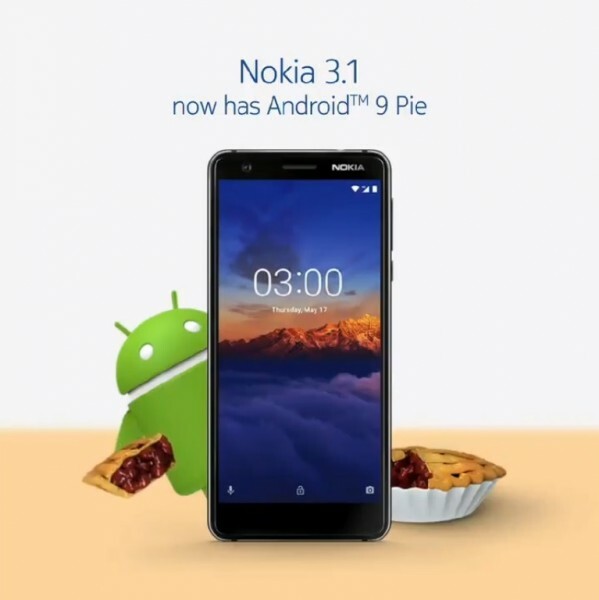 With the new Android Pie update, Nokia 3.1 users should expect new features like navigation gestures, redesigned UI, adaptive brightness, and adaptive battery. Since this is an Android one smartphone and also going by HMD's promises, users are slated for at least two years of major software updates which means the Nokia 3.1 will most likely get the Android Q update when it's available. List of HMD'S Nokia smartphones that are yet to receive the update includes the Nokia 5 which is expected to receive the update later this month followed by the Nokia 3 and the Nokia 1 which are scheduled for Q2 of this year.